The first glimpse of Building 25’s fourth floor from the central stairwell. That’s not gravel. In Queens Village, mere inches of brick and mortar separate the world we know from one of the strangest places in the city. 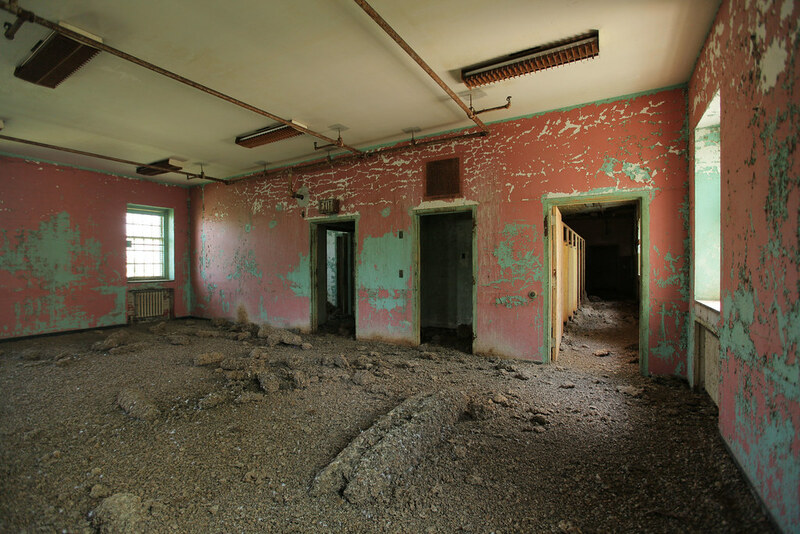 Once a haven for New York’s cast-out mentally ill, Creedmoor Psychiatric Center’s Building 25 has undergone something of a transformation over its 40 years of neglect. 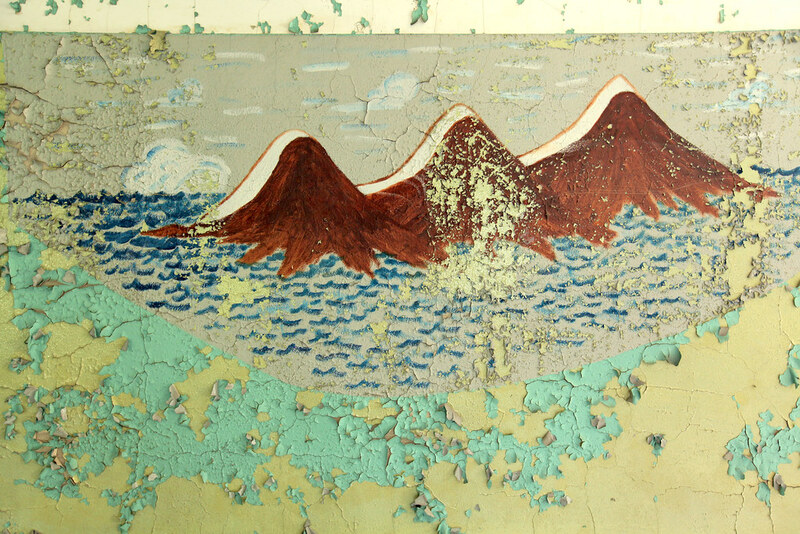 Creedmoor was founded in 1912 as the Farm Colony of Brooklyn State Hospital, one of hundreds of similar psychiatric wards established at the turn of the century to house and rehabilitate those who were ill equipped to function on their own. Rejected by mainstream society, hundreds of thousands of mentally disturbed individuals, many afflicted with psychosis and schizophrenia, were transferred from urban centers across the country to outlying pastoral areas where fresh air, closeness to nature, and the healing power of work was thought to be their best bet for rehabilitation. A few articles of clothing were left behind. As the 20th century progressed, asylums across the country became overrun with patients, and many institutions became desperately understaffed and dangerously underfunded. 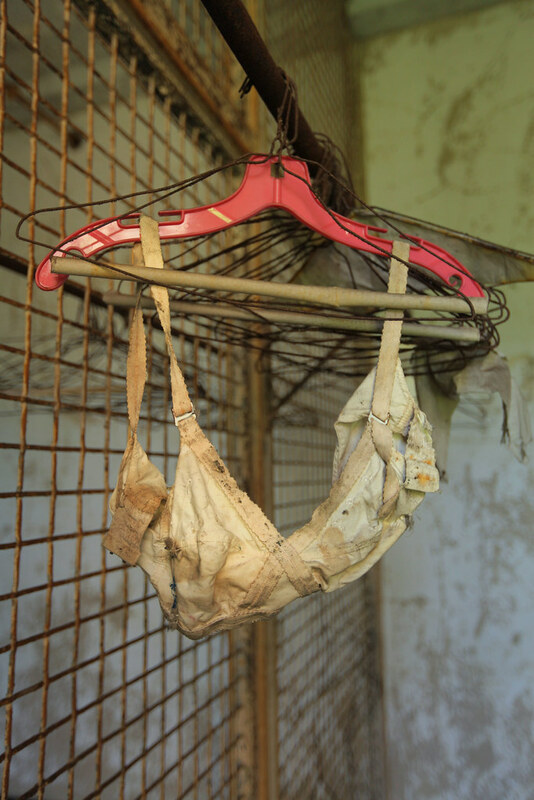 Living conditions at some psychiatric wards grew dire—patient abuse and neglect was not uncommon. 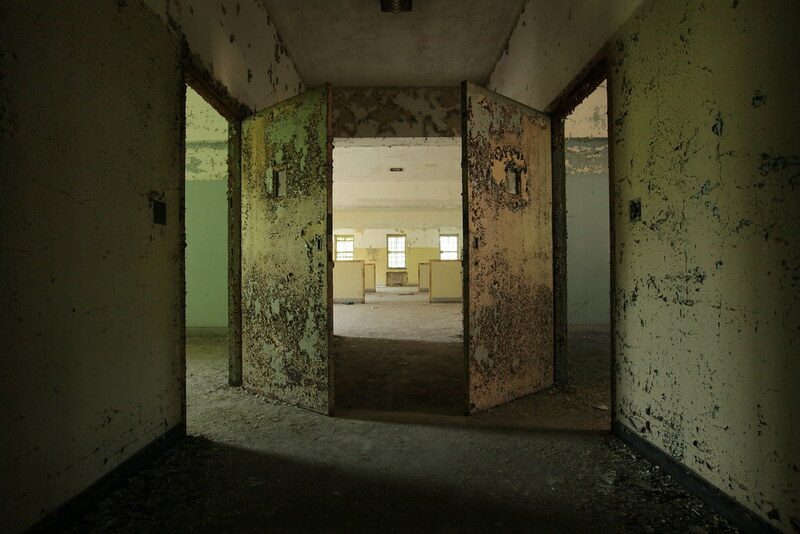 Creedmoor State Hospital was habitually under scrutiny during this period, beginning in the 1940s with an outbreak of dysentery that resulted from unsanitary living conditions in the wards. The hospital had spiraled completely out of control by 1974 when the state ordered an inquiry into an outbreak of crime on the Creedmoor campus. Within 20 months, three rapes were reported, 22 assaults, 52 fires, 130 burglaries, six instances of suicide, a shooting, a riot, and an attempted murder, prompting an investigation into all downstate mental hospitals. As late as 1984, the violent ward of Creedmoor Psychiatric Center was rocked with scandal following the death of a patient, who had been struck in the throat by a staff member while restrained in a straitjacket. In the late 20th Century, the development of antipsychotic medications and new standards of treatment for the mentally ill accelerated a trend toward deinstitutionalization. A series of dramatic budget cuts and dwindling patient populations led to the closing of farm colonies across the United States, and a marked decline at Creedmoor. The campus continues to operate today, housing only a few hundred patients and providing outpatient services, leaving its turbulent past behind. Many of the buildings have been sold off to new tenants. Others, like Building 25, lie fallow. The building was an active ward until some time in the 1970s, and retains many mementos from its days as a residence and treatment center for the mentally ill. With peeling paint, dusty furniture, and dark corridors, the lower floors are typical of a long-abandoned hospital, but upstairs, the effect of time has taken a grotesque turn. The smell alone is enough to drive anyone to the verge of madness, but the visual is even more appalling. For 40 years, generations of pigeons have defecated on the fourth floor of Building 25, far removed from their dim-witted dealings with the human world, assembling a monument all their own. Guano accumulates in grey mounds under popular roosts, with the tallest columns reaching several feet in height. Like the myriad formations of a cavern, Buiding 25’s guano stalagmites are a work in progress—pigeons roost at every turn, and they’re awfully dubious of outsiders. Violent outbursts of flight punctuate an otherworldly soundscape of low, rumbling coos. The filth acts as an acoustic insulator, making every movement impossibly close. 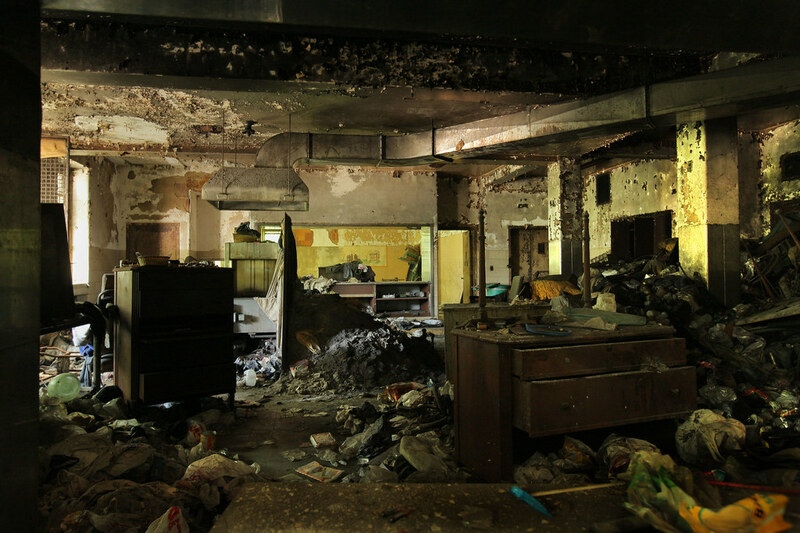 Two levels down and a world away from the top floor, a kitchen is filled with years’ worth of garbage intersected by narrow pathways. A living room, kept relatively tidy, features a sitting area with an array of chairs, including a homemade toilet. Loosely organized objects litter every surface—toiletries, clothing, hundreds of dead D batteries. Some of the belongings looked as if they hadn’t been touched for decades, but a newspaper dated to only a few weeks before confirmed my suspicion that someone was still living here. Overgrowth covered most of the windows, casting green light over much of the interior. Furniture stacked in a cafeteria on Building 25’s third floor. 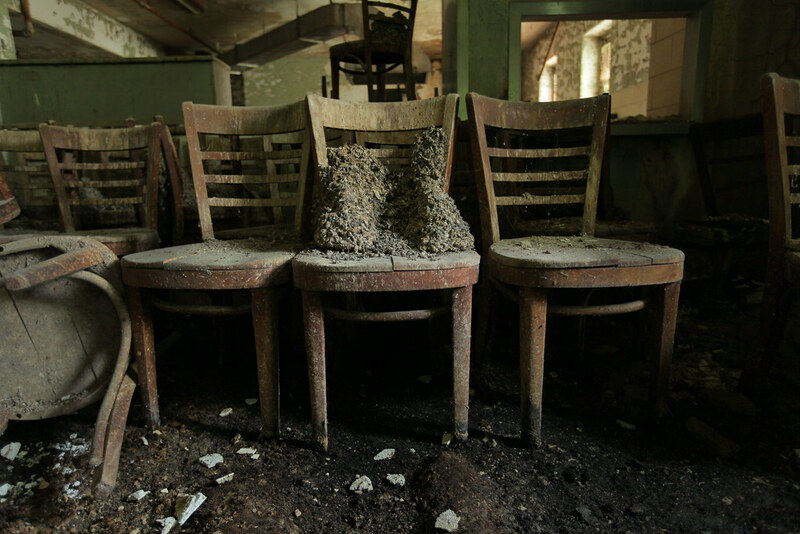 These chairs are popular with urban explorers, one went as far as covering the upholstery with fake blood. Metallic sheets are bolted to this bathroom wall in lieu of mirrors, which patients could use as a weapon. 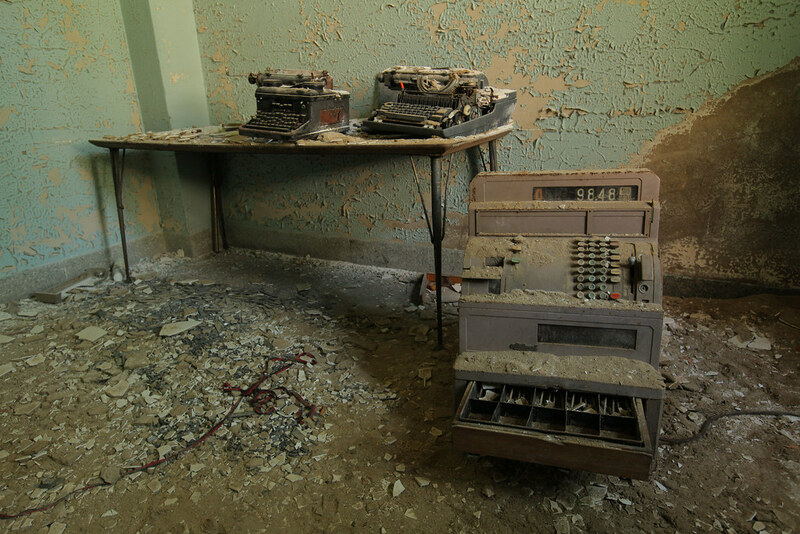 Even in the 70s, this equipment was outdated, and left behind. Did this mural prophesy the current condition of the top floor? An uninviting hallway on Creedmoor’s fourth floor. The guano gives some rooms the look of an indoor desert. A glimpse at the Creedmoor squat.